Ruby black color. Fruity, roasted aromas and flavors of roasted berries and apple, toffee, and hint of wood smoke with a supple, bright, fruity medium body and an effortless, stimulating, relaxed finish with notes of nuts, marinated cherries and beets and tomatoes with fine, dusty tannins and light oak flavor. A lovely Chilean red that will shine at the table. Bottom Line: A lovely Chilean red that will shine at the table. Carmenère is a red wine produced from the eponymous variety in Chile. It was originally thought to be Merlot that was brought over from Bordeaux in the 19th century, but in the mid-1990s, research proved it was not Merlot, but indeed Carmenère, which had been thought of as extinct. Top examples originate from the warm Maipo and Colchagua valleys in Chile; the wines are medium- to medium-full in body and offer red cherry fruit along with distinct pepper, tobacco and brown spice aromas and flavors. While early versions were rather bitter, recent examples have displayed great balance and refinement. Enjoy Carmenère between three to seven years after the vintage date in most cases. 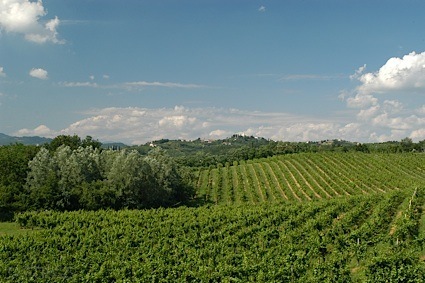 The wines pair well with most red meats and are especially enjoyable with heartier fare, such as grilled meats and game. 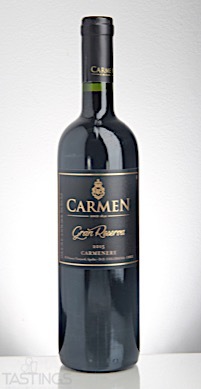 Carmen 2015 Gran Reserva, Carmenère, Colchagua Valley rating was calculated by tastings.com to be 90 points out of 100 on 9/26/2017. Please note that MSRP may have changed since the date of our review.